This article is cross-posted at Spurs Basketball. After a one-game absence, Tony Parker scored 31 points in his return to the starting lineup to lead the San Antonio Spurs to a 112-97 victory over the Washington Wizards on Monday night. 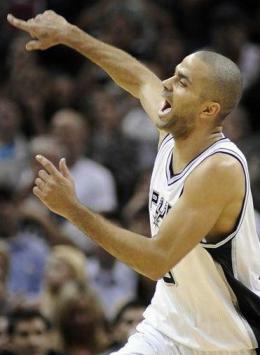 Tony Parker scored 31 points, leading the Spurs to victory over the Wizards. Parker, who missed Friday’s loss to the Los Angeles Clippers with a strained right quadriceps, hit 13-of-18 shots and had seven assists. Tiago Splitter scored 17 points and grabbed seven rebounds of the bench, while Tim Duncan added 14 points and nine boards in 28 minutes of action. DeJuan Blair had a double-double finishing with 11 points and 12 rebounds. The Spurs extended their winning streak over the Wizards to 12. Washington has lost nine of its last 11 and fell to 3-15 on the road. JaVale McGee led the Wizards with 21 points and 15 rebounds, and Jordan Crawford added 19 points. Before the game, veteran Spurs point guard T.J. Ford abruptly retired following the latest scare to his surgically repaired spine, which once sidelined him for an entire NBA season. Ford was injured on March 7 when Knicks guard Baron Davis elbowed him in the back, knocking him to the ground. The 28-year-old Ford didn’t move for several minutes and wobbled while being helped off the court. After trailing by as many as 18 points in the second quarter, Washington cut the deficit to nine in the fourth but could get no closer. The Wizards’ defense offered little resistance in the first half, as the Spurs took a 63-49 halftime lead while scoring 44 points in the paint. San Antonio hit 28 of 45 shots and had assists on 23 of those baskets. Manu Ginobili returned to the starting lineup, but went to the locker room with what appeared to be leg cramps midway in the third quarter. Ginobili finished with eight points and seven assists in 20 minutes of play. The Spurs will wrap up their seven-game home stand on Wednesday night when they host the Orlando Magic. Nice win by the Spurs, I hope Manu is really ok! and Good luck to TJ Ford. The Spurs did what they supposed to do against the lowly Wizards the next games could be daunting, I hope they are up to the challenge. Go Spurs Go! Parker is showing that he can lead this Spurs team, nice win over the Wizards. Go Spurs Go!